Offering you a complete choice of products which include dal packing machines. Capacity 500 grams to 1 kg. 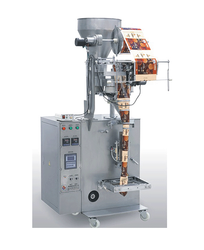 Extensive research and a market survey have enabled us to manufacture and exports an exclusive array of Dal Packing Machines in the market. Their fabrication process involves a use of quality-assured material and utilization of sophisticated designing patterns. Widely appreciated in the market for robust construction, high-performance, and longevity, our range of Automatic Dal Packing Machines can be customized to suit to client’s demands and specification.